The building intended to house the University of Vienna was built in 1753/1755 according to a plan drawn up by Jean Nicolas Jadot, an architect from Lothringen. The opening celebrations, presided over by Emperor Francis I and Empress Maria Theresia, took place in April 1756. In 1857 the building was presented to the Imperial Academy of Sciences - the Austrian Academy of Sciences since 1945 - which had been founded by Emperor Ferdinand I in 1846. The building site for the new assembly hall of the university was not chosen by chance, but was located in that part of town in which the university buildings had been since the late 14th century. The urban setting and the narrow building area called for an unusual design for this "Neue Aula". The narrow side, facing the square, needed to be emphasised by means of its main façade, which now competed with the previously dominant front of the University Church of the Jesuits as a standout feature, thus leading to a reordering of the visual framework of the square. Such a weakening of the sacred context of the square was symbolic of the reorganisation of the course of academic studies at the university, made manifest through the erection of the Neue Aula and which was taken out of the hands of the "Society of Jesus" in successive steps lasting until 1759. If at the beginning the main idea was to set up apartments in the new building for virtually all of the professors of the schools of law and medicine, their preferential treatment can be understood when one considers that particularly the practically oriented schools (law and medicine) were affected by the university reforms of the time. The driving force behind the speedy erection of the building was the Chancellor of the University of Vienna, Archbishop Johann Joseph Graf Trautson, whom Maria Theresia had entrusted with all building projects in March of 1753. No later than February 1754, the unification of the four schools in the new building was placed on the agenda, thus stressing the common identity of the academic disciplines - a point of view that was convincingly taken into account in the frescoes by Gregorio Guglielmi (1755) that decorate the "Festsaal" [great hall]. As far as can be inferred today from the written and pictorial documents, the erection of the new university building should in no way be interpreted as an isolated undertaking. In the final analysis it was part of a comprehensive plan to give the university quarter, which had been located there since the Middle Ages, a clearer structure and a new definition within the concept of town planning. 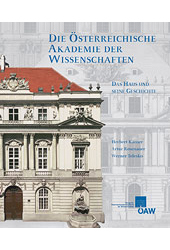 This publication offers a detailed study of the history and the design and decoration of the former assembly hall of the university - today the main building of the Austrian Academy of Sciences - and a description of the genesis and function of this building, all based on a large number of written and pictorial sources.